Home/Posts/Blog/What the Heck is a Key Award? What Are the Key Awards? The Key Awards started out as Design ‘XY (eg: Design ’76) sometime in the early ‘70’s. The title was changed to the Key Awards in 1979 to reflect the gold Key (to your new home) that had always been on the award plaques. —So that is where the KEY comes from! It was quite the shindig in its day. As many as 800 attendees, including many municipal officials. Everyone who was Anyone in the industry was there. It was termed “The Oscars of the Home Building Industry”. There were VIP guest speakers. 1979 featured the mayor of Chicago (Jane Byrne at the time) and was held at Navy Pier. There was always full press coverage and a list of all the award winners the next day in the local newspapers and industry magazines. The Crystal Key will be given to the best of a specific category. And a couple of photos. 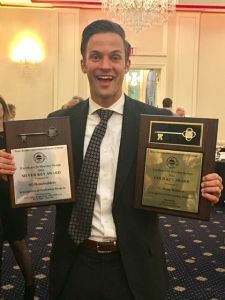 By Ryan Siebert|2018-09-26T09:02:53-05:00August 30th, 2017|Blog|Comments Off on What the Heck is a Key Award?